NAPLES — It's been more than 13 years since senior citizens at Naples Estates sued to win the right to own their mobile home park, but they're still waiting to buy it. After hearing days of testimony from appraisal experts, a Collier judge last year set the price for the close-knit East Naples park at $14.4 million, well over the $11.8 million the residents were hoping for. Since then, more residents in the age 55-plus park have died, others have given up or moved away — and the lawsuit has been at a standstill. "We just had another death," Barbara Brown, who has been on the homeowner association's board of directors for 19 years, said recently. "We've lost a lot of them. It's taken so long, I don't know how long I can hold out." Susie and Jack Setzer, residents for 12 years, are sick of waiting. "We haven't heard anything," Susie Setzer said. "It's just dragging out and everybody is tired of it. Management is trying to take over all the functions and we don't have any." In March 2009, Collier Circuit Judge Hugh Hayes ruled the purchase price would be based on the park's value on Feb. 24, 1998, when residents sued the mobile home park's then-owner Ell-Cap/75 to state their intent to purchase the park and exercise their right of first refusal if it were to be sold. Nearly 500 homeowners at Naples Estates, at County Barn and Rattlesnake Hammock roads, contend they have right of first refusal to purchase the 1960s park for $11M under a 1996 deed. They have three lawsuits going against the landlord, a multimillionaire who owns several mobile home parks and got this one as payment for a debt by the former landlord. That bankruptcy ruling, giving him the park, triggered the right of first refusal, Collier County Circuit Judge Hughes Hayes ruled. 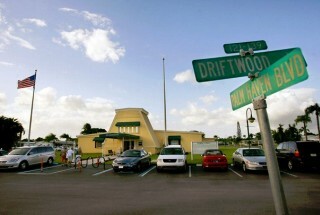 The mobile home park, at the corner of County Barn and Rattlesnake Hammock roads, was part of a bundled package of 39 parks that owner Jerry Ellenburg wanted to sell for roughly $390 million in the late 1990s. Back then, it was valued at $11.6 million — a price also cited in a 1997 agreement outlining the homeowners' right of first refusal to buy it. Months before setting the price, Hayes ruled residents weren't notified of Ell-Cap/75's intent to sell, which meant they had the right of first refusal to prevent Manufactured Home Communities (MHC) from buying the park. As a result, he agreed they had the right to purchase and operate it themselves. Residents have said they were unaware their park was being offered to Norton S. Karno, a millionaire businessman. Years later, Karno offered to pay each resident $1,680 if they would elect three new homeowner association board members. They refused, accusing him of wanting a new board so he could gain control and force them to drop their lawsuit against MHC, which he represents. Karno, who controls the park's management company, is one of the nation's largest operators of recreational vehicle, mobile home and manufactured housing communities. MHC's attorney, J. Allen Bobo, couldn't be reached for comment. But the homeowners' lawyer, A.J. Stanton, said both sides still are exchanging information to determine how much in profits earned by the owner must be given to the homeowners' association and how much of the loan on the property must be paid. "Mr. Karno assumed the original loan on the property but has not made any payments on it and has allowed the loan to accrue interest — presumably under the mistaken belief that my client will have to pay it," Stanton said of the park's homeowner association. Hayes has indicated a hearing on that loan is needed, but Stanton said he's still trying to depose Karno before that can occur. Also to be considered when the final price is set is $300,000 that the seniors paid for a new sewage system and $293,000 that Karno received from county government when he sold part of the land as an easement for a planned widening of County Barn Road, which never occurred. In addition, Hayes must sign orders to set purchase terms and the price, the residents' right to buy and legal fees. "Once all issues are resolved, I expect there will be an appeal," Stanton said, adding that he doesn't expect a resolution this year. "Our clients will continue to pursue the conclusion of this case so long as we live," he added. "If Mr. Karno thinks otherwise, he is gravely mistaken." Once the purchase price is determined, it will be up to each resident to obtain a loan to pay their share. Others may opt to pay monthly rent toward that, which may be less than they pay now. When Brown bought her mobile home in 1987, she was paying $160 monthly in base rent for the land it sat on. But as years went by, land rents increased while services decreased and seniors' rents rose from $420 to more than $600 monthly. Meanwhile, residents say new management is trying to woo new residents into signing leases, then win them over to their side by holding free parties. The homeowners association still asks for a $5 donation to offset fees and with seniors living on Social Security and tight budgets, many go for the free parties. "We've always been able to raise plenty of money," Brown said. "Now, it's tough."